We recommend that you and your child register for FSA IDs ahead of time, so you don’t experience delays later in the process. ​IMPORTANT: Your child must create his or her own FSA ID. You cannot create an FSA ID for your child. Also, when you register, you’ll be asked to provide an email address and mobile phone number. This is optional but highly recommended. These two items must be unique to each account. In other words, your email address and mobile phone number cannot be associated with more than one FSA ID. You and your child should create your FSA IDs now at StudentAid.gov/fsaid. Your FSA ID serves as your legal electronic signature throughout the federal student aid process. Do not share your FSA ID with anyone, not even your child. Your child should also not share his or her FSA ID with you. Keep your FSA ID information in a safe place. You’ll need it to renew your FAFSA form each year and to access federal student aid information online. Go to fafsa.gov and click “Start Here” under the “New to FAFSA.gov?” heading. Enter your child’s name, Social Security number, and date of birth. Then, click next. Choose which FAFSA form you’d like to complete. 2018–19 FAFSA form if your child will be attending college between July 1, 2018, and June 30, 2019. 2019–20 FAFSA form if your child will be attending college between July 1, 2019, and June 30, 2020. 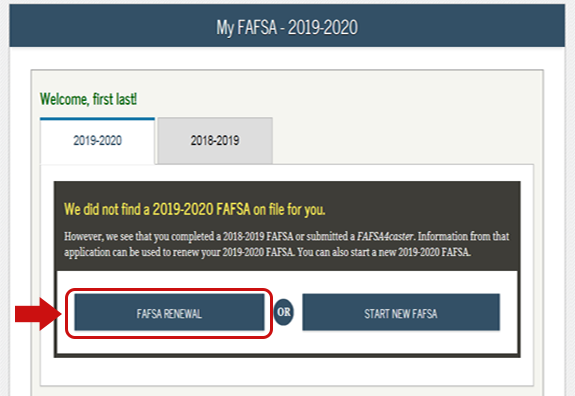 Both: If your child will be attending college during both time periods and hasn’t completed the 2018–19 FAFSA form yet, complete that first, wait until it processes (one to three days), then go back in and complete the 2019–20 FAFSA form after. Were you given the option to submit a FAFSA® Renewal? Create a save key. A save key is a temporary password that allows you and your child to “pass” the FAFSA form back and forth. It also allows you to save your child’s FAFSA form and return to it later. Once you create a save key, share it with your child. He or she will need it to complete later steps. — The FAFSA® form is the student’s application, not yours. When the FAFSA form says “you” or “your,” it’s referring to the student (unless otherwise noted). Your child should not be filling out their FAFSA online at the same time you are. Your progress can be lost if they click “Save” at a different point in the application. Click on the blue question mark symbol at the corner of each question. ​In the School Selection section, you’ll add all the schools you want to receive your child’s information. It is important that you add every school your child is considering, even if he or she hasn’t applied or been accepted yet. It doesn’t hurt to add more schools; colleges can’t see the other schools that have been added. In fact, you don’t even have to remove schools if your child later decides not to apply or attend. If your child doesn’t end up applying or getting accepted to a school, the school can just disregard his or her FAFSA form. You can remove schools at any time to make room for new schools. You can add up to 10 schools at a time. If your child is applying to more than 10 schools, here’s what you should do. ​In this section, you’ll be asked a series of specific questions to determine whether or not your child is required to provide your (parent) information on the FAFSA form. These dependency guidelines are set by Congress and are different from those used by the Internal Revenue Service (IRS). 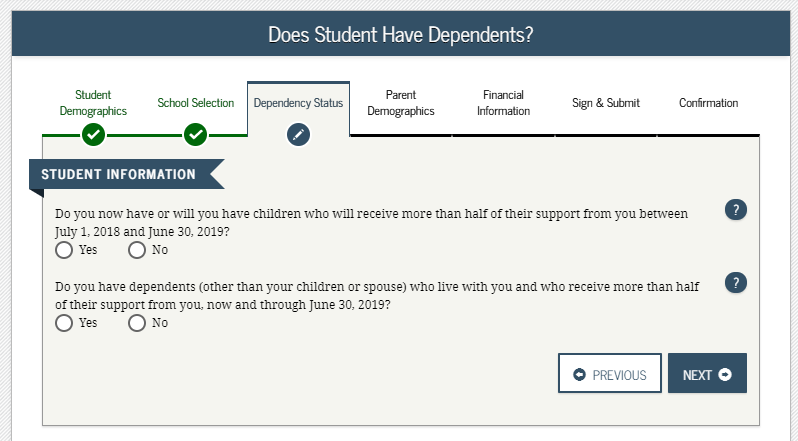 Even if your child doesn’t live with you, supports him or herself, and files taxes separately from you, he or she may still be considered a dependent student for federal student aid purposes. If your child is determined to be a dependent student, he or she will be required to report information about you. If your child is determined to be an independentstudent, you can skip the questions about providing parent information (unless otherwise noted by the school). ​This is where you’ll provide your own demographic information. Are you divorced? Remarried? Below is a guide to determining which parent’s information needs to be included on your child’s FAFSA form. For specific guidance, review our “Reporting Parent Information” page. ​This step is incredibly simple if you use the IRS Data Retrieval Tool (DRT). The IRS DRT allows you to import your IRS tax information into the FAFSA form with just a few clicks. Using this tool also may reduce the amount of paperwork you need to provide to your child’s school. So if you’re eligible, use it! Next, you’ll likely be asked to provide your child’s financial information. If your child filed taxes, the easiest way to complete this section is to use the IRS DRT. Your child would need to be present because he or she needs to provide his or her FSA ID to use the tool. If your child is not present, save and exit the application and instruct your child to log in with his or her FSA ID, retrieve the FAFSA form using the save key, and then use the IRS DRT to complete the FAFSA form and sign it. If your child did not file taxes, you can enter his or her financial information manually (if you have access to the required information). If you don’t have access to the information, save and exit the application and instruct your child to log in with his or her FSA ID, retrieve the FAFSA form using the save key, complete the FAFSA form, and sign it. NOTE: If you need to save and exit your child’s FAFSA form so he or she can complete the remaining information, you’ll need to log back in and sign your child’s FAFSA form before your child can submit it. Both you and your child need to sign the FAFSA form. The quickest and easiest way to sign your child’s FAFSA form is online with your FSA ID. Sign your child’s FAFSA form with your FSA ID first. Save and exit the application. Instruct your child to log in using their FSA ID and sign the FAFSA form. If you or your child forgot your FSA ID, you can retrieve it. Make sure you and your child don’t mix up your FSA IDs. This is one of the most common errors we see, and why it’s extremely important for each person to create his/her own FSA ID and not share it with anyone. Make sure the parent who is using his/her FSA ID to sign the FAFSA form chooses the right parent number. If you don’t remember whether you were listed as Parent 1 or Parent 2, you can go back to the parent demographics section to check. If you get an error saying that your FSA ID information doesn’t match the information provided on the FAFSA form, here’s what you should do. Note: This is often the result of mixing up the student and parent FSA ID. We recommend signing the FAFSA form with an FSA ID because it’s the fastest way to get your child’s FAFSA form processed. However, if you and/or your child are unable to sign the FAFSA form electronically with an FSA ID, you can mail in a signature page. 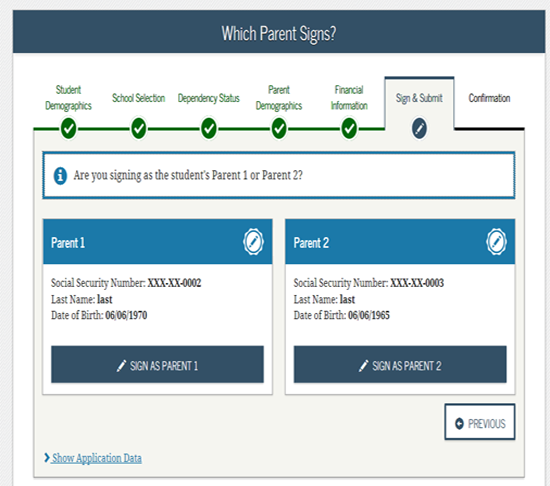 From the sign and submit page, select “Other options to sign and submit” and then choose “Print A Signature Page.” Just keep in mind that your child’s FAFSA form will take longer to process if you go this route. If you have multiple children who need to complete the FAFSA form, you can use the same FSA ID to sign FAFSA forms for all of your children. You can also transfer your information into your other children’s applications by choosing the option provided on the FAFSA confirmation page. ​Your child is one step closer to getting money for college. With the hard part over, learn what your child should do next after submitting the FAFSA form.